CINCINNATI - AJ McCarron's performance during the Cincinnati Bengals' mock game indicated that he's ready to challenge for the backup quarterback job. A day after one of his best practices of training camp, McCarron was accurate with his throws during the team's annual mock game at Paul Brown Stadium on Saturday. 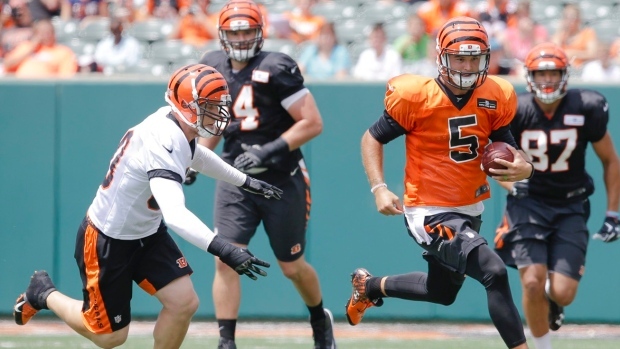 McCarron missed all of his rookie season while recovering from a sore shoulder. He was impressive in his first time running the starting offence. The 2014 fifth-round draft pick from Alabama led an 11-play, 75-yard drive that ended with his 24-yard touchdown pass to rookie Mario Alford. His next drive ended with a field goal. McCarron finished 7 of 9 for 76 yards. "This is almost like my rookie season," McCarron said. "That's the way I'm taking it because I didn't do anything last year. This is the first time I've been in training camp, first time thrown in full pads since senior year. "It was going to take time. That's why I stayed confident throughout the whole thing. I never panicked." Both McCarron and starter Andy Dalton got off to slow starts on Saturday. Each of their first drives ended in punts with one first down combined. Dalton, going against the No. 2 defence, connected with tight end Tyler Eifert on a 3-yard touchdown during his third and final series before McCarron took over. "I thought the quarterbacks overall (did well) because we didn't turn the ball over," offensive co-ordinator Hue Jackson said. "That's a good day. "Our quarterbacks were playing pretty aggressive and moving around, and that's the way you have to play this game. You have to play loose and have fun." McCarron is competing with Josh Johnson for the No. 2 job behind Dalton, who has not missed a full game because of injury during his four-year career. McCarron said he was prepared to go in with the No. 1 offence during the mock game, unlike practice the previous day when he was thrown into the mix unexpectedly. He completed 9 of 14 passes on Friday during 11-on-11 team drills and said he felt even more comfortable Saturday. "Going against the (No.) 1 defence, it's tough, but we still got some good plays in, and when I was able to come over with the 1s, I just felt in a rhythm," McCarron said. "I was seeing everything clean. I was able to sit in the pocket and let the ball rip." Notes: Wide receiver Marvin Jones (hamstring) dressed Saturday and stretched with his teammates for the first time in a week but was limited to working out on the side. ... There were no injuries during the mock game, but there was one brief scare near the end. Rookie tight end John Peters collided with safety George Iloka while going up for a catch. The tight end went down hard, but popped up after a few minutes and jogged off without a problem. ... Dalton finished 9 of 13 for 69 yards and one touchdown and seemed to have good chemistry with Eifert. The two connected on a 22-yard pass that got fans excited early on Dalton's final series, which ended with the 3-yard touchdown pass to Eifert.